Sometimes we become accustomed to images of a person at a certain stage of life. Thus we look upon pictures of them at a different age with some surprise. My great-grandfather became an elderly man with a very wide part, but he did have a considerable amount of hair as a young man. Seeing his signature makes him seem more real to me. John Dodson Taylor, Sr. (1860-1936), had a sister, Sarah Rebecca Taylor, who married Andrew Hassell, of Lynchburg, Virginia. These are the best images of the notices I can acquire. I scanned photocopies from another source, so at least they are somewhat legible. John Dodson Taylor, Sr. (1860-1936) was my great-grandfather. SUMMERVILLE, Ga., July 3–Business hours of this community were closed as final rites were held at 4 o’clock this afternoon for Colonel John Dodson Taylor, distinguished Chattooga County citizen and pioneer northwest Georgia business leader. The Rev. Sterling Hunter, pastor of the Summerville Presbyterian Church, of which Colonel Taylor was a lifelong member and a ruling elder, officiated at the services. Several hundred persons attended the funeral. Colonel Taylor, who was 76, died early Thursday morning at a private Atlanta hospital in Atlanta following a brief illness. He was widely known throughout the state and prominent in many enterprises. Burial was in Summerville cemetery. Colonel John Dodson Taylor, of Summerville, distinguished citizen of Chattooga County and active in business, civic and church affairs, died early yesterday morning at a private hospital in Atlanta. Colonel Taylor, who was 76 years of age, had been ill only a short time. His keen mind and vision made him one of the most outstanding leaders in business and citizenship in Chattooga County. He was organizer and president of the Summerville Cotton Mills, the Summerville Oil Mills, the Chattooga County Bank, and the Taylor Mercantile Company. In addition, he owned large farms and peach orchards in the county, was was senior member of the law firm of John D. & E. S. Taylor. He was a lifelong member and a ruling elder of the Summerville Presbyterian Church. Colonel Taylor served with distinction in the state senate as the representative of his district. A native of Summerville and lifelong resident of that city, Colonel Taylor was the son of John Taylor and Arcissa Willshire Dodson, of Chattooga County. He received his formal education at Oxford, Ala., where he met his wife, the former Miss Harriet Stoddard. Surviving are two sons, John D. Taylor, Jr., and Eugene Stoddard Taylor, and two daughters, Mrs. Wilford Caulkins, of Chattanooga, and Mrs. John B. Whisnant, of Summerville. Funeral Services will be held at 4 o’clock this afternoon at the Summerville Presbyterian Church, with the Rev. Sterling Hunter, pastor, officiating. 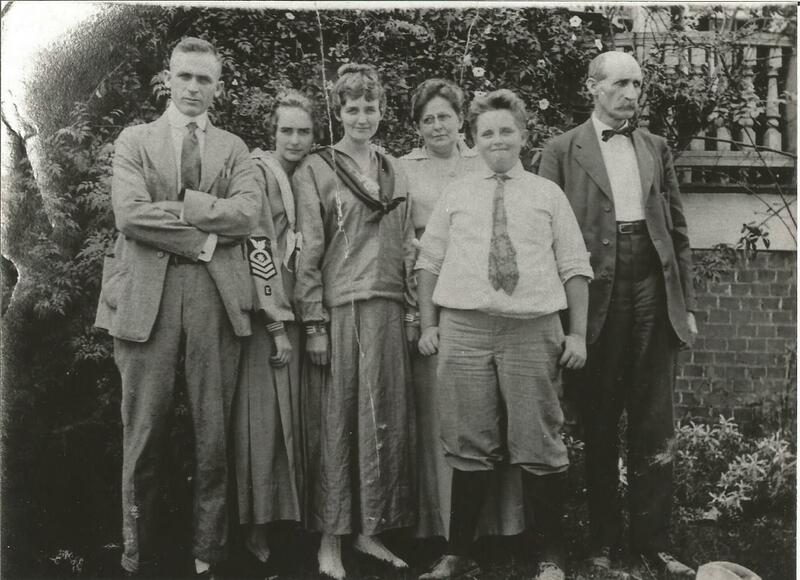 The family members are standing in front of the old house at Summerville, Georgia. I conclude that the date is no earlier than 1915, for Arcissa Wilshire Dodson Taylor (1824-1915), mother of John Dodson Taylor, Sr. (1860-1936), is absent. My great-grandfather, John Dodson, Taylor, Sr. (1860-1936), founded the private school in Summerville, Georgia, in 1919. It closed five years later. TAYLOR INSTITUTE This was a private school established in 1919 by John D. Taylor, Summerville businessman. 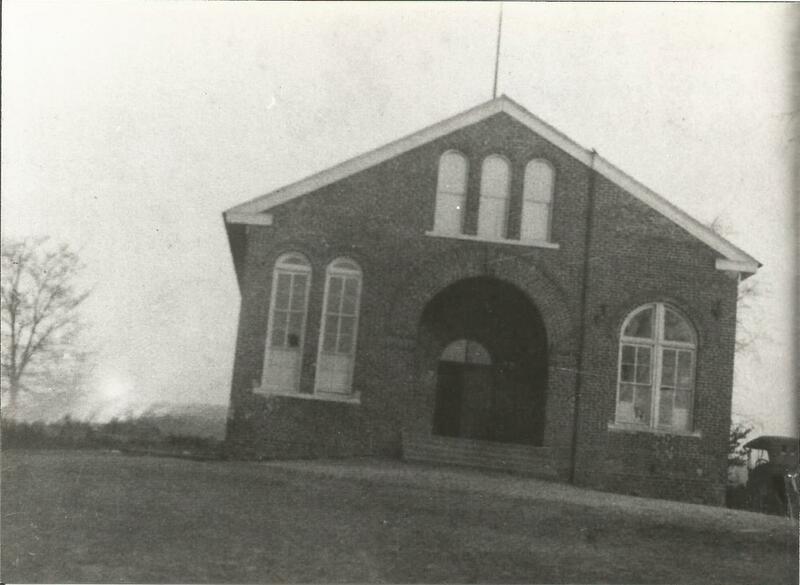 It was located on the east side of Highland Avenue in the building that had been the Summerville School until 1914. 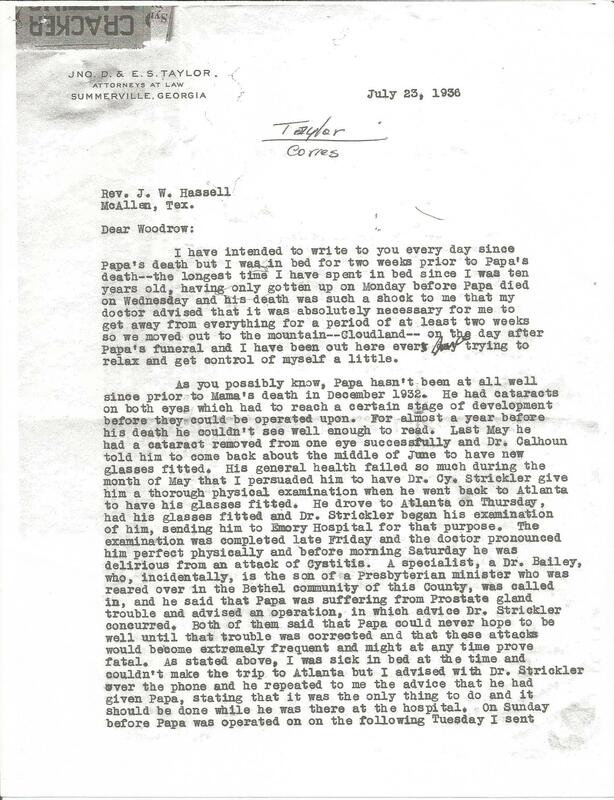 Mr. Taylor felt that the County Board of Education did not always maintain the educational standards he felt they should, and he was determined to have the best school possible for his youngest child, John D. Taylor, Jr.
Mr. Taylor went to Peabody College, a teacher’s college in Nashville, Tenn., and asked the school to recommend someone to administer the private school he was planning to open in Summerville. 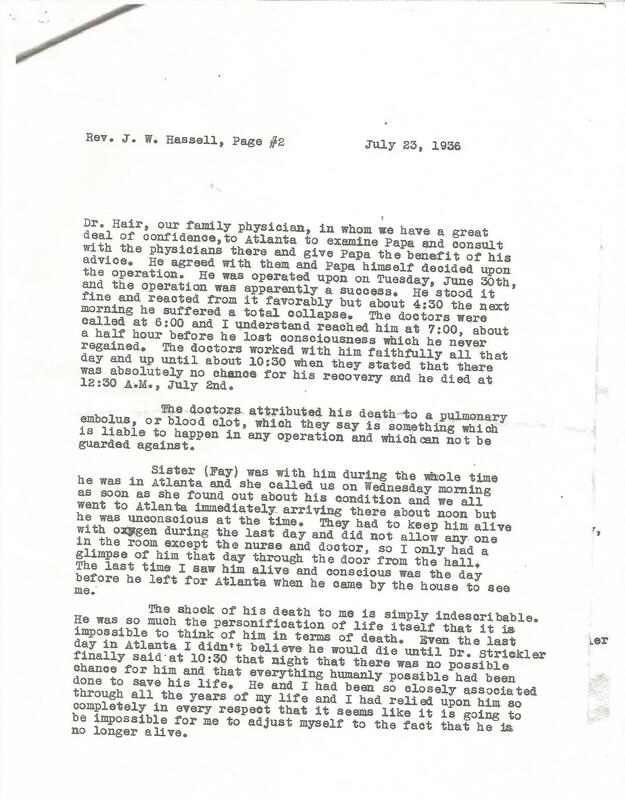 Prof. Charles E. Bell was recommended, and Mr. Taylor contacted Mr. Bell and employed him as principal of the school. Prof. Bell and his wife, Nell, were the teachers and the curriculum included arithmetic, Latin, history, reading, and sight singing. Twenty-four students were enrolled the first year of the school and about fifty the second year. 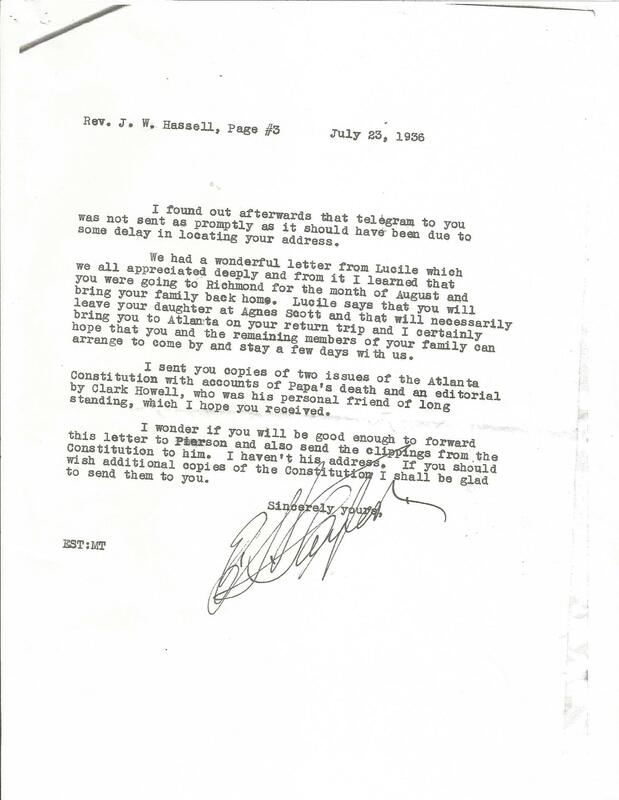 By 1921 Miss Edith Wilson of Knoxville, Tenn., had been employed as a teacher to assist Mr. and Mrs. Bell. T.I. had its share of extra-curricular activities. This included a debating team, a band, and a championship basketball team coached by Prof. Bell. 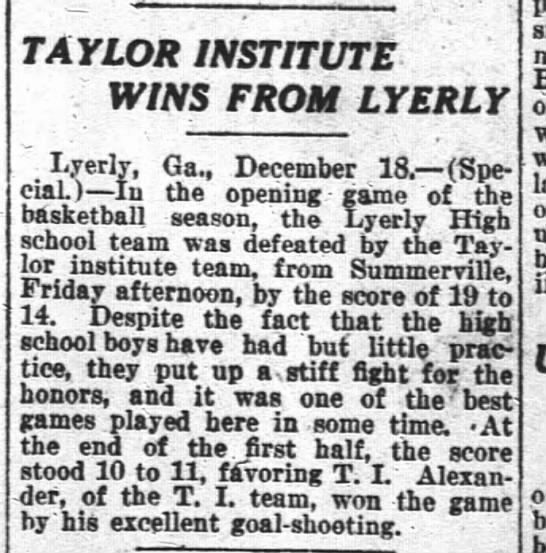 By 1924 Taylor Institute had served the purpose for which it was established, and Prof. Bell accepted a job as principal of the school at Trion, and secretary of the YMCA there. 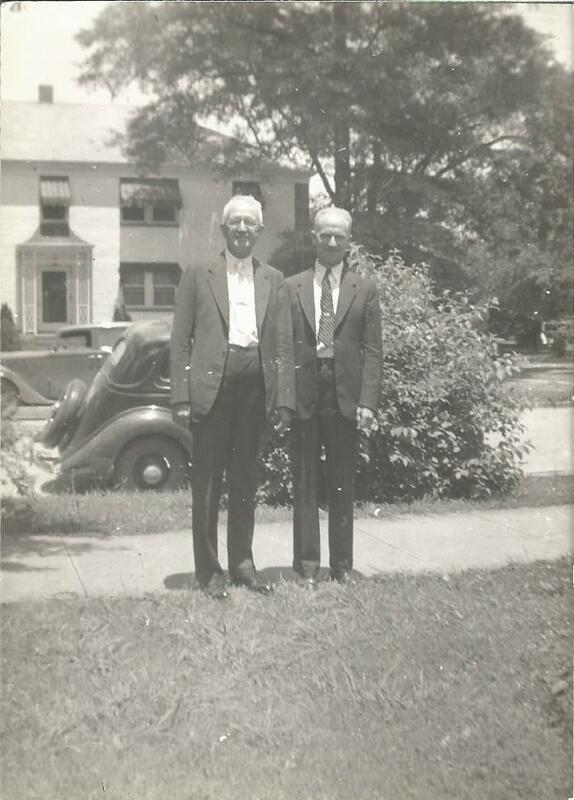 John Dodson Taylor, Jr. (1905-1976), was my grandfather. The Taylor Institute was the private school my grandfather, John Dodson Taylor, Sr. (1860-1936), founded and operated in Summerville, Georgia, for a few years.